A company you already love dropping a new product you know you’ll love before you even get it? Where my pre-order form at? I had a funny feeling (in the good way) about these new eye shadows. I already love and use the contour palette daily. 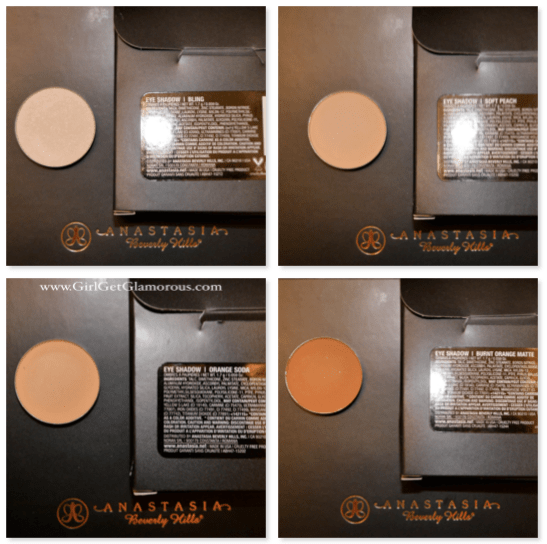 I was surprised by how creamy the contour powders were and easy to blend. The blending is so essential in making your makeup look natural. So I had a good feeling about the eye shadows. I follow Anastasia Beverly Hills on Instagram and they promised the shadows would be super pigmented and easy to blend. You order the shadows as a single pan, or can order a set of 4 or set of 8 that come in a black case. 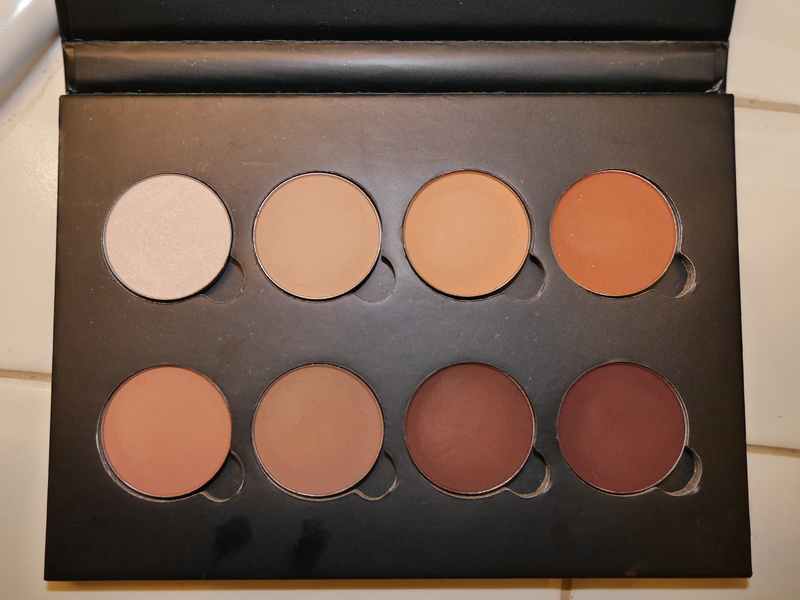 You order whatever shades you want and then place the pans in the black case to create a palette. You can also order a Z-Palette, $20, which is an empty, super durable magnetic flat container that you fill with whatever pans you want – blushes, eye shadows, etc. A Z-Palette is traditionally more for a professional makeup artist, so they can put all their favorite shades in one place and not have to open a million containers. But these palettes are amazing for space saving and creating your own color palette of the shades that work best for you. $70 felt like a lot of cashoola to me at first, but then when I did the math and realized you are essentially paying $8.75 each for the shadow and case, that makes them super competitive. But again, I’m not writing this from the back of a chauffeured Rolls Royce. I get it. If I were just starting out my makeup kit, I’d buy the 4-pack and get “Bling” for the inner corners and under my brow bone, “Soft Peach” for my crease shade or lid shade on natural makeup, “Birkin” for a semi-deep lid shade, and “Hot Chocolate” for a liner or smokey eye shade. At any rate, let’s break down why I think these are a great investment. The texture on these is so, so smooth. I found them to blend easily and last at least 12 hours with primer. They don’t irritate my eyes at all. Texture and being able to blend easily are my two biggest factors in how effective my makeup is. I want my makeup to do what it’s supposed to do (contour, highlight, etc.) but then also disappear almost into my skin so that it doesn’t look like I’m really wearing makeup, no harsh lines, etc. I’m 3 for 3 on that with Anastasia products: dipbrow, contour kit, and now these eye shadows. Also, I went to get a hair out of my eye and brushed my eyelid. I couldn’t believe how silky the eyeshadow felt. This was after 12 hours of wear and it felt like silk, not a hint of chalkiness in sight. This is a huge win factor for me. I had customized a Z-Palette before that I use quite a bit, so I liked the idea of being able to create my own eye palette. I am very fair skinned and I’ve been wanting to create a lighter, matte shadow palette in neutral browns and earth tones. I have a lot of palettes, but the darker shades tend to get not used as much in them. So picking 6 lighter and medium shades and 2 darker ones was a perfect combo for me. I used this palette yesterday on myself and a fair skinned client and loved the shades on both of us. Super natural looking but still made the eyes pop. My client texted me and said “I just stared way too long at myself in the mirror.” That gave me a good laugh and is also a great message to get after doing someones makeup. I’m totally obsessed with these shades and I love that I’m getting full use out of all of them. There are shades available in every finish and color you can think of. I order one satin finish and seven matte finishes. I have a borderline unhealthy obsession with matte shadows. But I ordered a satin to see the difference in the finish. I ordered Bling, Orange Soda, Soft Peach, Warm Taupe, Hot Chocolate, Deep Plum, Burnt Orange Matte, and Birkin. Side note: these are all excellent shades for strawberry blondes and redheads. “Soft Peach” in the crease and across lid, “Bling” in inner corner and under the arch, “Hot Chocolate” over Lancome Kohl eyeliner in black and in outer corner. Burnt Matte Orange across lid, Deep Plum in the outer corner. Love how the pop of orange under the eye brightens the whole look. 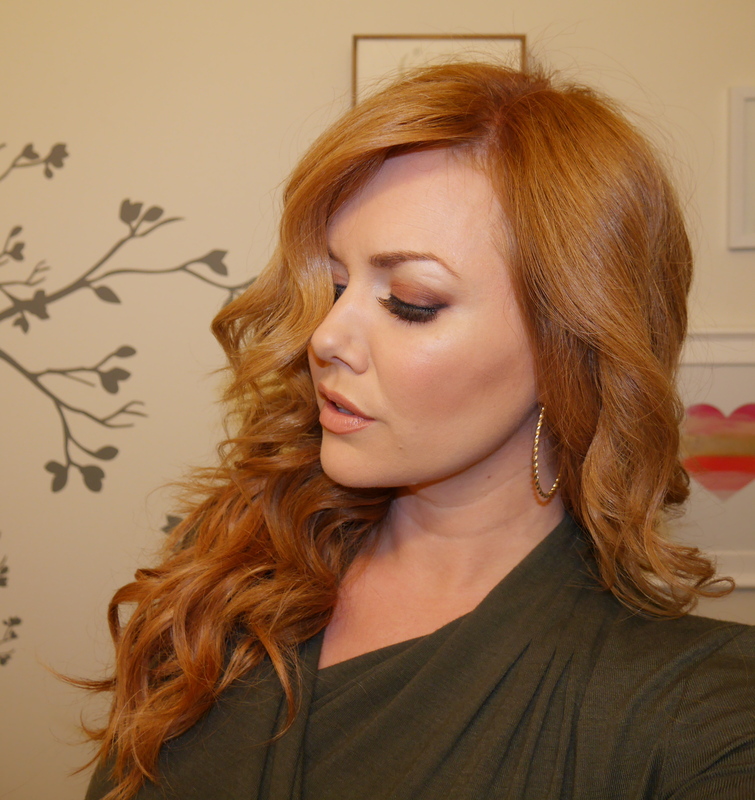 “Burnt Matte Orange” across lid and under eye, “Bling” in inner corner and under brow arch, “Deep Plum” in outer corner. 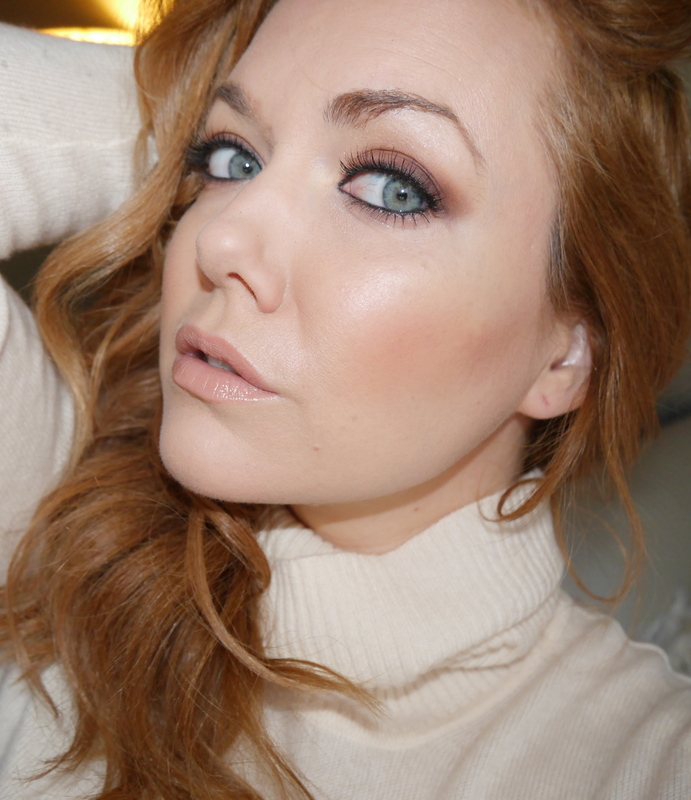 Contour: Becca Lowlight cream, with Anastasia contour powder in “Fawn” to set. Thank you for reading! Are the product breakdowns of what I used in the looks above helpful? Let me know! If you like them, I’ll keep doing them. Please feel free to share, just click on the “Pin It” button to share on Pinterest or the Facebook button below to share on your Facebook wall. You can follow @girlgetglamorous on Instagram for daily makeup pics. 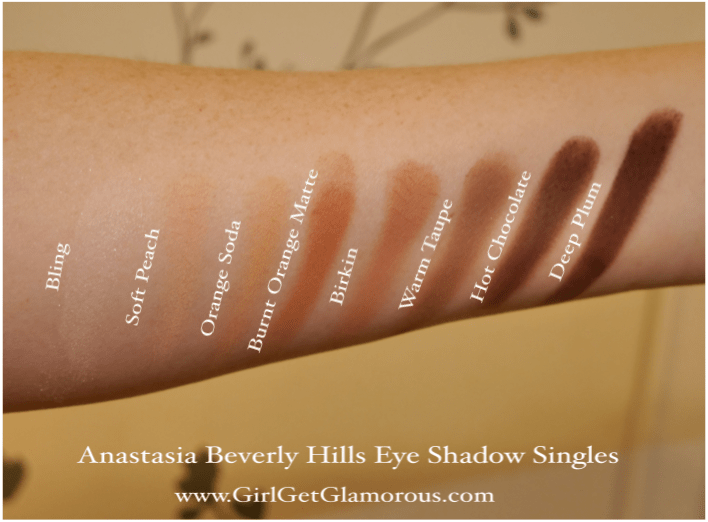 What’s your favorite shade from the Anastasia colors? Any you are going/wanting to try? Leave me a comment below! They look gorgeous!! And so do you these are great pics as per usual. I’m sure I’ll break down and buy some soon enough ha. Thanks for sharing. 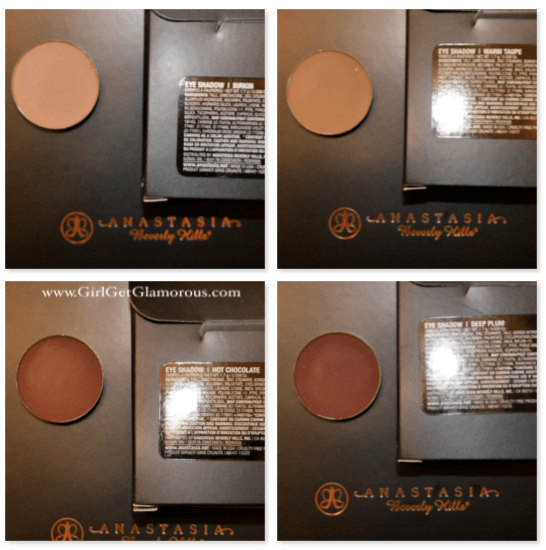 I am considering purchasing some of those; do you think Anastasia eye shadows fit into a MAC cosmetics palette? No prob, glad the post helps! The eyeshadow pans seem to be the same size, so I think the would fit in a MAC palette. In terms of quality alone, which do you like the most? MUG, ABH, MAC, Stila, etc? Hi there, in terms of pigment, I think Lorac shadows actually apply the most color, even without a primer. I like different things about each brand though, that make them stand out for me.